In a turn of events that seemed improbable a week ago, Senate Republicans voted to begin debate on a series of proposals to repeal and replace Obamacare this afternoon. 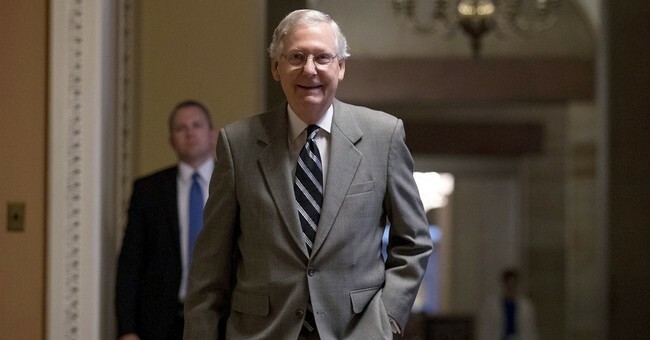 Mitch McConnell needed every single "aye" tally he got, as Susan Collins and Lisa Murkowski sided with Democrats to attempt to block the process from moving forward. But after left-wing agitators were arrested for disrupting Senate proceedings with angry chants, and John McCain dramatically arrived in the chamber for the first time since his brain cancer diagnosis, Vice President Mike Pence broke the deadlock. The motion to proceed (MTP) succeeded, 51-50. Hat's off to McConnell for getting his 50. MTP had looked doomed. But BIG gap between voting to proceed & final passage of an actual bill.